Everything including Tessa is homemade in this project. 🙂 I don’t take full credit for Tessa… maybe 25% of her genes. The wood is red oak and not really a great choice because of the open grain. But it was available and inexpensive enough for learning the ropes on running the HB2. Because of the glare it looks better in person than the photo. Three coats of shellac give the oak this color. Then the color paint and lastly a coat of clear varnish. 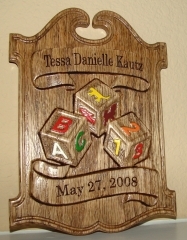 I am sure it will be treasured by Tessa as something her grandpa made for her on her first birthday.